Travel arrangements and prices detailed on this www Internet site are provided and coordinated by Bright, Mount Beauty and Myrtleford Visitor Information Centres. Bright, Mount Beauty and Myrtleford Visitor Information Centres has taken due care and responsibility to verify and check all information in this Internet WWW site as at the time of compilation. However, as the relevant accommodation & tour operators in this brochure supply this information, it accepts no responsibility for any inaccuracy or misdescription contained in this publication or information as so supplied. 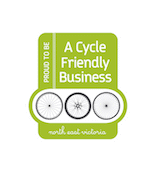 Sales of services as contained in this publication are made by Bright, Mount Beauty and Myrtleford Visitor Information Centres, only as an agent for the person, business or company providing the services. Bright, Mount Beauty and Myrtleford Visitor Information Centres does not accept responsibility for any changes in price variation of services shown. All services and prices are subject to change without notice. Bright, Mount Beauty and Myrtleford Visitor Information Centres collects PII such as your full name, address, email address and/or telephone number whenever you submit a query or suggestion, or request assistance with a booking. Information collected when you purchase from Bright, Mount Beauty and Myrtleford Visitor Information Centres is used to charge your credit card and deliver your booking confirmation electronically. We may also contact you about your stay for customer service purposes or to make any changes or cancellations to your booking. Bright, Mount Beauty and Myrtleford Visitor Information Centres provides the guest name, telephone number, address and email address for each booking made to the relevant accommodation supplier. Our accommodation suppliers require this information for the booking and if they need to contact you about the booking. Although Bright, Mount Beauty and Myrtleford Visitor Information Centres offers accommodation from reputable accommodation suppliers, we have not placed specific limitations on these suppliers from using or disclosing your information without your permission. Therefore, we encourage you to review the privacy policies of any suppliers whose accommodation you purchase on Bright, Mount Beauty and Myrtleford Visitor Information Centres. Bright, Mount Beauty and Myrtleford Visitor Information Centres may be required by law to disclose information provided by you to Bright, Mount Beauty and Myrtleford Visitor Information Centres for the purposes of obtaining products or services from Bright, Mount Beauty and Myrtleford Visitor Information Centres . Bright, Mount Beauty and Myrtleford Visitor Information Centres may also disclose information against someone who poses a threat to Bright, Mount Beauty and Myrtleford Visitor Information Centres interests (such as customer fraud) or whose activities could cause harm to others. If at anytime you would like to alter the PII you provided to Bright, Mount Beauty and Myrtleford Visitor Information Centres in your booking, please contact us. If at anytime you wish to enquire about any of your PII that is stored by Bright, Mount Beauty and Myrtleford Visitor Information Centres please contact us. Whilst we provide a Free Booking Service, cancellations of Confirmed bookings (where payment has been made) will attract a AUD$33.00 (inc. GST) Administration Fee. The Administration Fee is in addition to the Cancellation Fee of the Service Provider/Operator. We reserve the right to offer alternative accommodation/tour of a similar standard in the case of the accommodation/tour operator overbooking their property or for any reason beyond our control. All information on this web site is correct at time of publishing. All companies listed are members of Bright, Mount Beauty and Myrtleford Visitor Information Centres. Bright, Mount Beauty and Myrtleford Visitor Information Centres makes no representations of fact, nature, quality and suitability about any or all of the activities promoted on this site and user agrees that the user shall be responsible for first satisfying himself/herself by independent enquiry or advice as to the suitability of the particular activity. Any access of this site by the user is entirely at the users own risk and Bright, Mount Beauty and Myrtleford Visitor Information Centres shall not be responsible for the propagation of computer worms or viruses transmitted from the site.